In this episode, a giant pig destroys Tokyo. 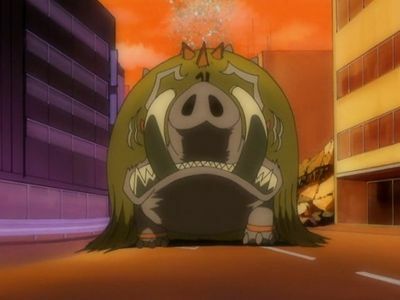 The dragon is in the Chinese Zodiac too, but no... you get a pig. It's really not fair to talk about this episode on its own. It's the first part of the midseason climax, that part halfway through the season that hits a crescendo and amps everything up before things transition into the second half. Adventure didn't quite pull this off but it's in every other season and most anime that goes longer than 20 episodes. Given the less grandiose start to the season, the startling images in this episode and the next are powerful. They are arguably more devastating than what we see in the final arc, for while the horrors there are inflicted on one girl, the whole of Shinjuku is subjected to what Vikaralamon (and later Yamaki and Makuramon) unleashes. Best exemplified here, the Myotismon arc in Adventure and much of what goes on in Data Squad, real world carnage just has a bigger impact. It hits harder when neutral human civilians are the ones facing the destruction, and where off screen casualties are an inevitability. Unlike the Myotismon arc, where the collateral damage was minimal and off camera (save for a few expendable landmarks like Tokyo Tower), Vikaralamon's rampage is put on full display here. Streets, businesses and homes are torn to shreds while we, and the Tamers, watch helplessly. They're helpless, of course, until they decide to just wish hard enough for the blue cards to appear so they can go Ultimate. Yeah, the whole blue card thing was pretty much a farce after all and it really was magic (okay fine, the sincere wishes of the children) that made it kick. It's a bit disappointing that all the cyperpunk-ish mystery ends up with such a primitive solution. Even factoring in the mechanism that powers such wish fulfillment (we'll get into those guys later), it still comes down to “wanting it bad enough” and that adds nothing new to the franchise. What is nice is that Henry, Rika and Takato are each able to draw from what were seemingly innocuous moments from the beginning of the episode. Each of the three have an argument with a family member, but each of the circumstances are so different and of such varying rarity that a connection between the three isn't registered until the very end. We haven't gotten a nag session from Takato's mother in a while, but it's not the first time and she's probably justified in doing so. 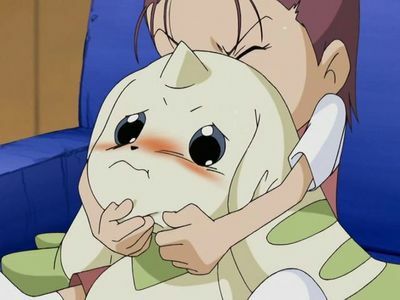 When he fears that recent tremors may be Digimon-related, Henry nearly has to rip Terriermon out of Suzie's hands, yelling at her in the process. Given that to Suzie, this was just a brother and a sister fighting over a stuffed animal (gee, that sounds familiar), even Terriermon was put off by Henry's attitude. Rika just has another banal argument with Mom about clothes. Nothing to see there. As different as the three were, they all amount to the same thing and is on each tamer's mind as they wish to protect the ones they love. Granted, Takato has a classic goggleboy moment when he ups his wish to protect “the whole darn city” instead. The main battle is pretty standard fare, however, compared to what's going down at Hypnos. While Janyuu is still working on decrypting Shibumi's data, Yamaki wants to push the “blow all the Digimon up” button and he wants to push it now. The little information Janyuu is receiving is giving him reservations on taking down the entire project. When Vikaralamon strikes, their polite disagreement is no longer so friendly and they nearly come to blows. Janyuu is afraid a boosted Juggernaut program would take out the tamers' Digimon too, which Yamaki is more than comfortable with. Yamaki even makes a pretty good point that no matter how much Janyuu would like to salvage something from the original project, better to destroy Terriermon than Henry. Or, given the way Juggernaut acts, it just may take out both to be on the safe side. Rika's line about boys only being interested in posters of bikini girls is a touch risque, but nothing that should raise any flags. What is interesting is that they had the gumption to have Kazu revisit it later and confirm Rika's suspicions. 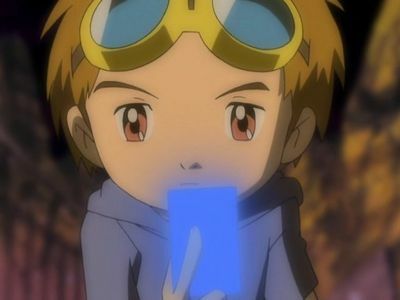 Jeri may not be chasing stray Digimon around, but her obsessive behavior is seen again here as her newbie deck is gigantic and includes cards that Kenta and Kazu are dying to have. That deck didn't materialize out of thin air; she had to put the time and financial commitment in to build it. What's more shocking? The fact that Rika's nice enough to give Jeri a basic primer of the game (uneven as her instruction is) or the fact that her lessons didn't come around to have an impact in the battle? The answer should probably be the latter. While the scene is supposed to show how Rika is far more cooperative now, cooperation has never been her weak point... it's been attitude. The Chinese Zodiac reveal is useful to us as a reference, but how does it actually help the kids? The Devas don't adopt the size or the attack patterns of their associated animals (roosters don't actually eat electricity and sheep aren't proficient with a crossbow) and knowing the mythology is no more useful than knowing the Japanese legends behind Renamon's assorted forms. The real question is why anti-human Digimon are molded out of a human myth, but that's not one to ask when you're fighting the damn things. One of the things destroyed during Vikaralamon's warpath was an overpass. Keen eyes may have noticed that this overpass shows up in several episodes of Tamers and seems to be a go-to location. I felt a blow to the gut watching it go down. Why's it important? Watch the Serial Experiments Lain opening, which concludes with a long sequence of Lain ascending and crossing an overpass. You'll also note brief shots of a drainage tunnel and a parking garage. There's a reason the more psychologically savvy fans consider Jeri to be mildly autistic. That obsessive behavior is par for the course. I'm pretty sure that overpass was in 02 as well.